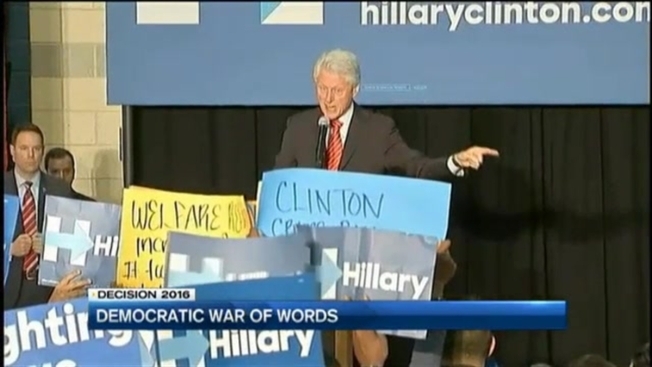 Bill Clinton Rallies for Hillary Clinton in R.I.
Former President Bill Clinton has rallied hundreds of Rhode Islanders to support the presidential run of his wife, Hillary Clinton. The Providence Journal reports that he spoke to about 1,500 people at the Community College of Rhode Island in Warwick on Thursday. He was applauded after calling Republican presidential candidate Donald Trump's plan to deport all illegal immigrants morally and economically wrong. He later lunched at Tommy's Pizza in Cranston with Democrats including Gov. Gina Raimondo and House Speaker Nicholas Mattiello. Bill Clinton is the first major political figure to campaign in Rhode Island ahead of the state's April 26 presidential primary. It's unclear whether Hillary Clinton or other candidates plan to visit. Hillary Clinton and her Democratic rival, Vermont U.S. Sen. Bernie Sanders, have opened local campaign offices.